Installation of 21 micropiles through the existing footer and 24 tiebacks through the existing wall. The micropiles and tiebacks will be tied together with a new retaining wall poured in front of the existing retaining wall. Brayman was subcontracted to install a 5719 SF soil nail wall as part of a spillway expansion project at the North Fork Dam near Black Mountain, NC. Both soil nails and tieback anchors were installed on this wall which served as a slope stabilization measure for construction of a permanent access road on the site. Brayman was subcontracted to provide specialty geotechnical construction services in support of a roadway and bridge reconstruction project located between milepost 39.62 and milepost 44.04 along the Pennsylvania Turnpike in Allegheny County, PA. The Prettyboy Dam project involved the installation of an underwater anchorage system necessary to secure the concrete gatehouse to the dam. This project consisted of replacing two concrete bridge decks with a contracted time of 225 hours. This project consists of four and one-half feet drilled Shafts at the abutments and six and one-half feet drilled shafts at the river piers. The dam received a structure upgrade in 2018, which included over 16,000-cy of mass concrete, 68-ea high capacity dam anchors, and 175-ea drains. Brayman’s work consisted of the installation of four drilled sump foundations and as well as 250 concrete spread footers, pedestal supports, wall piers, building foundations, and containment slabs to support the various equipment for the gas processing facility. Twenty-three post tensioned dam anchors were installed to upgrade capacity of the dam while working around multiple other sub-contractors in very tight access. The New River Parkway is a Heavy Civil Project encompassing the construction of just over five miles of new roadway, while maintaining traffic along the New River in Hinton, WV. Brayman has completed two of the three bridges in 2017 including Romigh Road Bridge which is a two lane 80-feet long span, and Snake Run Bridge which is a three lane 123-feet span. Brayman is set to complete the third and final Park Quarry bridge in summer of 2018. The project comprised the installation of 86 caissons with diameters ranging from 30" to 54". The modernization effort at this site will ultimately result in the construction of two new 84-feet wide by 720-feet long chambers to replace the existing 56-feet wide lock currently in operation. The project required the installation of 578 micropiles with diameters of five and one-half-inch, seven-inch, and nine and five-eights-inch, and depths ranging from 30 feet to over 100 feet. Brayman was contracted by a midstream operator to complete the micropile installation at their new gas processing Cryogenic and De-Ethanizer facility located in Washington County, PA. The Allegheny County Sewer Authority awarded Brayman the emergency procurement contract to repair and replace the A-34 Diversion Structure located along the Allegheny River in the Lawrenceville neighborhood of Pittsburgh, PA. Ten vertical drain holes were core drilled from the crest of the dam 120 feet deep into the dam. Nine 5/8th inch micropiles were installed under an active high-speed rail line with no interruption to rail service. Brayman's scope of work required the installation of 318-each caissons comprising 239-each, 60-inch diameter; 58-each, 54-inch diameter; 18-each, 48-inch diameter; and 3-each, 42-inch diameter shafts. The project consisted of the replacement of the existing two-span adjacent box beam superstructure, with a two-span continuous composite steel plate girder bridge. Brayman Construction was contracted to perform the $25.4 million rehabilitation of the 7th Street “Andy Warhol” Bridge for the Allegheny Department of Public Works. This award winning new bridge is a cable stay structure with 326’ tall delta shaped towers and a 900’ main span (the longest span ever constructed by ODOT). Brayman’s scope of work involved installation of a 335-feet long driven sheet pile retaining wall along the Elk River, as well as installation of a temporary 35-feet long sheet pile wall outside of the high water mark. Brayman was contracted to provide specialty construction services in support of the Dam Safety Assurance (DSA) Phase 3 Project at Bluestone Dam. Brayman was contracted by Songer Steel Services, Inc. to complete the concrete foundations for a new gas processing De-Ethanizer facility being constructed by a midstream operator located in Butler County, PA. The new 130-feet long two-lane bridge consisted of a single-span steel beam five-girder structure with new abutments supported by drilled caissons and rock anchors. Brayman was subcontracted to provide specialty geotechnical construction services in support of the 414 Light Street Apartment Complex project located at the corner of Light and Conway Streets on the edge of the Inner Harbor seaport of Baltimore, MD. The Pennsylvania Department of Transportation’s replacement of the SR 136 Bridge near Eighty Four, PA, was the first use of a two-span continuous fabricated structural steel precast concrete deck module system in Pennsylvania. Brayman’s scope of work required installation of a secant pile excavation support system comprised of 152-each, 48-inch diameter interconnecting secant piles (12,309-LF) with depths up to 91-feet, as well as installation of 150-each, 18-inch diameter augercast piles for structure foundation support. The McKnight Road project involved bridge rehabilitation, including deck replacement, of four structures along a stretch of road infamously known locally for traffic congestion. 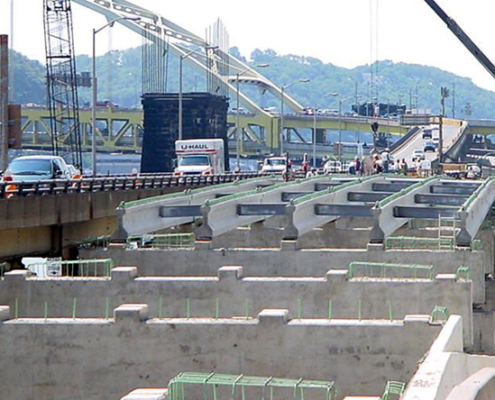 The Pennsylvania Department of Transportation’s replacement of the SR 30 Bridge near East Pittsburgh, PA, was comprised of the complete demolition of the existing superstructure, replacement of abutment stems, installation of precast deck modules, and setting of sleeper and approach slabs. The Pennsylvania Department of Transportation’s Replacement of the Hulton Bridge near Oakmont, PA, involved the replacement of a two lane truss bridge with a new 1,633 LF four lane five span haunched girder bridge erected upstream of the existing bridge on the Allegheny River. The Lilly Bridge project involved replacement of a cantilever truss bridge with a new 1,220-LF five-span, fabricated steel girder bridge. Brayman’s scope of work included installation of 11-each large diameter shafts, up to 240-feet deep and 42-inch diameter, which will be used for various utilities. Work consisted of 2 temporary "fill walls", needed to support the existing roadway in fill areas until new MSE walls could be constructed and 2 permanent "cut walls", needed in areas where the new third lane construction required cutting existing embankments. Brayman’s scope of work included installation of soldier beams, and tiebacks anchors while working closely with other contractors on precast panel installation and backfilling activities. The new 338-feet long two-lane bridge was constructed with the substructure founded on cast-in-place concrete pipe piles. The project scope involves building seven, separate precast concrete structures offsite, then loading the segments onto barges, delivering them to the job site, and assembling them into place, under water, using floating A-frame cranes. The Masontown Bridge project involved the replacement of an existing 11-span, two lane steel truss structure with a new 1,700-LF 7-span four lane plate girder bridge. The project consisted of two phases. Phase 1 involved the installation of an anchored sheet pile retaining wall and the installation of eight 120-inch diameter caissons. Phase 2 included the installation of structural steel beams and the construction of a 120-foot by 46-foot concrete deck. Post tension anchors, spillway access platforms, underwater anchors, increased dam height via post tensioned pre-cast panels, 2 mile access road, shoring, caissons, soil nail wall, this job had it all. Brayman was selected to install 50 epoxy coated dam anchors, which upgraded the structure to current federal dam safety standards. Brayman was contracted to replace the existing seven-span steel truss Greensburg Pike Bridge carrying SR 7467 over Turtle Creek and three active Norfolk Southern rail tracks located in Allegheny County, PA. The Rodney Staton Memorial Bridge project involved the design/build rehabilitation of a 630-LF, three span structure spanning R.D. Bailey Lake. This project consisted of a new four-span steel structure bridge for CSX Railroad, located in Youngstown, Ohio. Not only was our team able to prevent the roadway from sliding into Ten Mile Creek, we also prevented an ensuing road closure accompanied by a 35-mile traffic detour. Brayman was contracted to install precast concrete coffer boxes around the pipe to allow for easier access to the pipe for cleaning operations. Brayman's scope of work required installation of an 800-foot, tieback-anchored soldier beam and lagging wall, comprised of 99-each soldier beams; 91-each, 7-strand and 8-strand Class I corrosion protected anchors; and 15,000-SF of mixed 4-inch thick hardwood lagging. When a portion of the northwest wingwall collapsed, the Maryland DNR and DGS contracted with Brayman for an emergency stabilization. The remediation included salvaging the original facing stones, removing the existing bridge deck, and excavating 9 feet below deck elevation. The Ices Ferry Bridge project involved the replacement of a steel through-truss bridge with a new 960-LF four-span steel girder bridge located near Morgantown, WV. The Pennsylvania Department of Transportation awarded Brayman to rehabilitate the existing Strank Bridge located in Johnstown, PA.
Brayman was contracted by PennDOT to widen PA State Route 28, section A50, located near downtown Pittsburgh. This project exemplified Brayman's ability to offer "one stop shopping" for construction services by featuring several capabilities including high capacity dam anchors, temporary shoring, and driven piling. This project involved the installation of 212 high capacity rock anchors, ranging from six to 61 strands, to upgrade the stability of the existing dam. The new River Wall project is a component of a larger effort to improve and modernize the navigation facilities on the Lower Monongahela River between Braddock and Charleroi. Brayman’s scope of work required installation of deep foundation systems for the elevated guideways and stations. Brayman was contracted by the WV Division of Highways to construct a new 2,975’ long concrete segmental bridge outside of Charleston, WV to carry eastbound I-64 over the Kanawha River. As part of the third lane expansion of the Pennsylvania Turnpike from MP 67.59-MP 74.59, Brayman performed 30,000-ft of drilling and onsite batching of 16,000-cy of grout to stabilize an abandoned coal mine adjacent to the roadway. Completion of this project further extends Allegheny County’s Light Rail System from underneath downtown Pittsburgh and the Allegheny River to the North Shore. Brayman Construction Corporation was contracted by PENNDOT to repair and strengthen the existing Freeport Bridge over the Allegheny River north of Pittsburgh, PA. The project involved the rehabilitation of an 11 span, curved girder bridge linking SR 2083 - Section A01, ramp S to SR 2037 - ramp T in Allegheny County, East Pittsburgh Borough. This project consisted of shoring an existing active rail that was to remain after bridge removal. 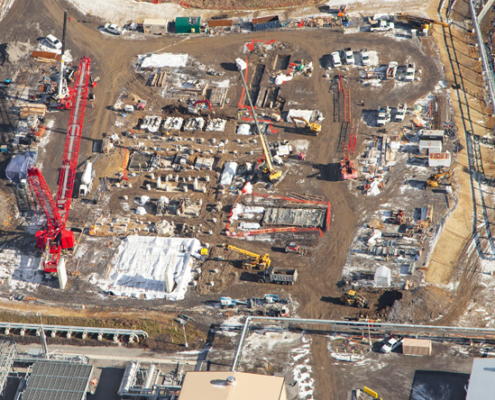 Brayman was subcontracted to provide foundation support for the construction of the new three-building Westinghouse Global Headquarters and Education Campus located on an 83 acre parcel in Cranberry Township, PA.
At the time one of the largest micropile projects completed in the US. Over 1600 micropiles and Low Mobility Grouting installed in karst Limestone as part of a 320 million dollar plant upgrade. Work involved the installation of deep foundation systems requiring in excess of 5,000 driven H-piles (over 75 miles) and nearly 300 micropiles. Brayman was contracted to provide specialty construction services in support of a safety improvement project located at Paddy Creek Dam on Lake James near Nebo, NC. Brayman was contracted by the Black & Veatch Corporation to construct a new barge unloading and mooring facility as part of the necessary flue-gas desulfurization (FGD) upgrades at the existing Cardinal Power Station located in Brilliant, OH. Erected just upstream of the old bridge, the new 1096lf structure is a three-span steel haunch plate girder design carrying two lanes of traffic plus an eight-foot wide sidewalk. The work included the reconstruction of overpass connections to Fort Pitt Boulevard, and construction of a new three-span bridge and ramps.